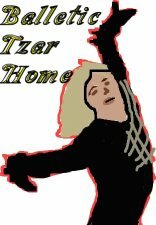 Welcome to my web site for the 2001, 2003, and 2004 World Champion, and Olympic Gold Medalist in men's figure skating, a true Tzar of the ice, Evgeni Plushenko! Evgeni first burst onto the world scene at the age of 15, capturing a bronze medal at his first senior world championships, shortly after winning the Junior Worlds at age 14. The thing I like most about him is his amazing athletic ability. Not too many people can jump in the air, turn four times, land on the edge of a skate blade backwards, and then turn and jump, then turn three times, land again and jump without picking into the ice and turn two or even three times and land perfectly on one foot backwards, then finish a four and a half minute program flawlessly. Plushenko does this, over and over again, for a living! He seems to me to be a contemporary type of skater, like Ilia Kulik or Phillippe Candeloro. There is speculation about things he does on the ice, yet he does not shy from who he really is, a clown, which is always a compliment to a guy. I hope you enjoy this page, I make it for fans like me who just want to hear what others think of Plushenko. Below is a list of updates that have happened recently in the site's "life," Plushenko's life, and for inquiring minds, my life. November 3rd was Evgeni's 24th birthday. Hope he had a great one! For the many American fans, Thanksgiving is just a little more than 2 weeks away! Better get the turkey and all the trimmings! November 6th, 2006: Well, very old news LOL, Maria gave birth to their son, formerly named Kristian, now named Egor, on June 15th. Strangely enough for those of you who follow Ilia Kulik and Ekaterina Gordeeva, their daughter Elizaveta was born the same day, only in 2002! Site Updates: Just messing around with things currently. Check About Zhenya. I have not managed to update the Chronologie In Quotes page in a long time, I know that LOL it's hard compiling all of them and keeping up with them. But I hope to take some time in the future to add as many memorable commentator quotes as I can find. I'm really making an effort to try and edit my site more. If I am able, I'd love to share more of my graphics with all of you. Keep an eye out for frames, snowglobes, wallpapers, edge effects, and more! That is, if I get photographers' permission! God bless Evgeni Viktorovich and his family. I am proud of your accomplishment at the Olympics. I won an award! My friend Andrea has given it to me. It is posted below. I got another award today from my friend Kali! It is pictured below as well.